Husb and I spent a lovely afternoon in Llandeilo, meeting up with a friend and going for a walk through the woods to the old Dynefwr Castle which dates from the 12th century, Norman times. The heatwave was going full blast and it was really hot by the time we reached the castle so I found a shady spot to sit and scribble. Here’s a bit of it, drawn into my A5 clothbound sketchbook that I’d prepared with ripped parcel paper, drawn with Faber Castell Pitt pens, sizes S, F and B in sepia. I used a bit of Indian ink wash on the shadows and a touch of white conte crayon in the highlights. 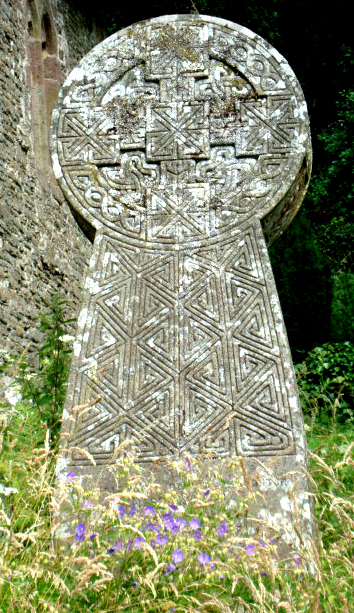 We passed though an old overgrown graveyard next to a small chapel and I took a snap of this amazing gravestone, completely carved with Celtic knotwork designs. I was ‘babysitting’ the current show at Elysium Gallery earlier this afternoon, doing my volunteer stint for the day and a shy young man wandered in, wearing a Big Issue seller’s tabard. He asked if it was alright to come in, he was very nervous. I made him welcome and he really liked the exhibition. I chatted to him and he said that he loved art and when he finishes selling the mag each day, he goes back to his tiny room and spends hours drawing Celtic Knotwork. Celtic Knotwork!!!! Have you ever tried drawing Celtic Knotwork? I have – it’s really hard. And this guy is absorbed in it for hours each day. It’s so easy to judge people by their appearances and fail to see the human being behind the stereotype. He said he’d call in again. I hope he does. When I left the gallery the sun was streaming down, rare for Swansea and I didn’t want to go back to my studio – I’m getting a bit stir crazy and the place smells of rabbit skin glue at the moment – horrible. So I went walkabout and sat on a wall by the Big Issue office in St. Helen’s Road. 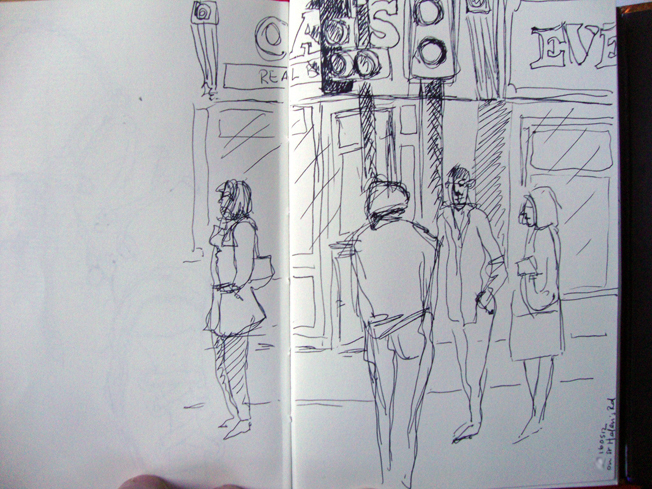 I sketched the people using the traffic crossing. It wasn’t easy because they don’t stay still for long and dart across the road really quickly, so it was a good exercise for me. They weren’t bunched together in a group – I drew them singly and tried to fit them together as best I can. 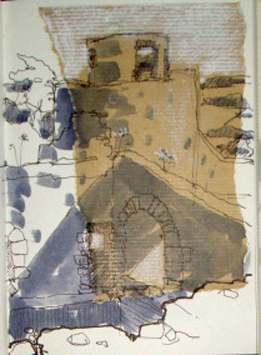 Back to the smelly studio tomorrow – hope it rains.